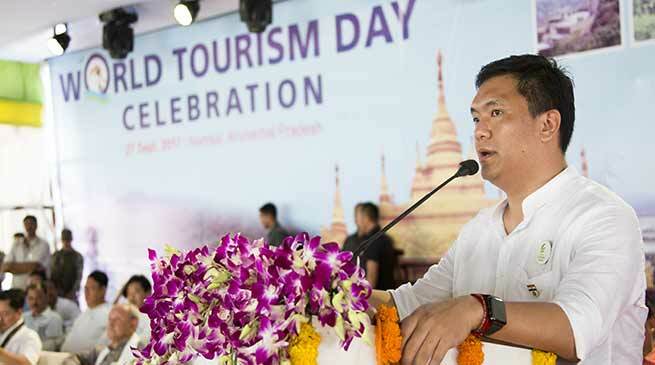 Chief Minister Pema Khandu celebrated the World Tourism Day here today amidst the gathering of tour operators, cultural troupes and participants from all over the state. The day long celebration organized by the Tourism department was held at the campus of Arunachal University of Studies, which began with the lighting of lamps by the Chief Minister and other dignitaries. Addressing the gathering, the Chief Minister lauded the initiative of Deputy Chief Minister, Chowna Mein for hosting the celebration here in a grand manner. He hoped that with such initiatives, eastern parts of Arunachal should be able to catch up with western Arunachal in tourism industry. Highlighting on major challenges to tourism industry in the state, the Chief Minister cited lack of proper connectivity as the main hurdle. He also said lack of airport facility in the state capital greatly hindered air-services as all the completed ALGs remains unused. He said lack of awareness among locals for promotion of tourism also caused hindrances to tourism industry. On connectivity, the Chief Minister said the centre is giving big push for connectivity with plans to connect all foothills in the state with railway network. He stressed on frontier highways, which will connect all border habitations in the state situated near the international border. He said the centre is likely to okay the proposal for frontier highway very soon. Speaking on the importance of ‘word of mouth’ advertising for tourism promotion, the CM advised the people to be sensitive to visitors, as any bad image can negatively impact the state. He said a place with good scenery and good infrastructure becomes secondary if people’s behaviour towards guests are improper. The Chief Minister said the state has seen steep rise in tourist inflow every year, which during the previous year accounted for 4 lakh domestic tourists and 6000 foreign tourists. He, however, discouraged such tourists who makes no positive contribution and suggested the state should go for high-end tourism. Speaking on state governments initiatives in tourism, the Chief Minister said the Deen Dayal Upadhyaya Swavalamban Yojana has been specifically launched targeting this sector. He said the state government is giving high priority to tourism and has increased the allocation to the department to Rs 100 crore from this financial year, which earlier received meager Rs 16 crore. He suggested the department to take on board tour operators too while framing policies and programmes. Earlier speaking on the occasion, Minister of State for Home Affairs, Kiren Rijiju said no matter how good policies may be with regard to tourism, it’s success finally rests in the hands of the people. He urged the youths that if they feel for the state then they must work to make their society peaceful first, which is essential for the state to grow particularly in tourism sector. Deputy Chief Minister who also spoke on the occasion brought out the achievements of the state government in development of tourism sector. The keynote address was delivered by Tourism Parliamentary Secretary, PD Sona and the welcome address by Tax &a Excise Parliamentary Secretary, Zingnu Namchoom. Tourism Secretary, Dr Joram Beda, delivered the vote of thanks. During the celebration, Chief Minister and Union Minister felicitated Everester Tine Mena and Anshu Janshempa respectively. The Chief Minister earlier inaugurated the laboratory block of the AUS University and Union Minister Rijiju laid the foundation for residential block. The celebration was also attended by Speaker TN Thongdok, State BJP President Tapir Gao, cabinet ministers Kamlung Mossang, Alo Libang, Dr Mohesh Chai besides other legislators and officials.